This fun and easy to make side dish, by our friend Paige from An Uncomplicated Life Blog, is a great way to enjoy fresh, organic vegetables at all your summertime festivities. Combine the veggies with olive oil and vinegar, season well with salt and pepper, and marinate for at least two hours. We love pairing it with our Sauvignon Blanc alongside fish or grilled poultry! In a large bowl, whisk together the olive oil, lemon juice, and vinegar. Finely dice the herbs and stir in to the oil and vinegar. Set aside. Cut the vegetables in large, bite sized pieces. Flash steam the asparagus by blanching in hot water for about one minute. You want it to be bright green but still crisp. (If using fresh sweet corn, blanch before removing from the cob. Frozen corn does not need to be cooked as it’s blanched before it’s frozen.) Add the veggies to the oil and vinegar mixture and season well with salt and pepper. Mix well, covering all the vegetables evenly with the seasoned marinade. 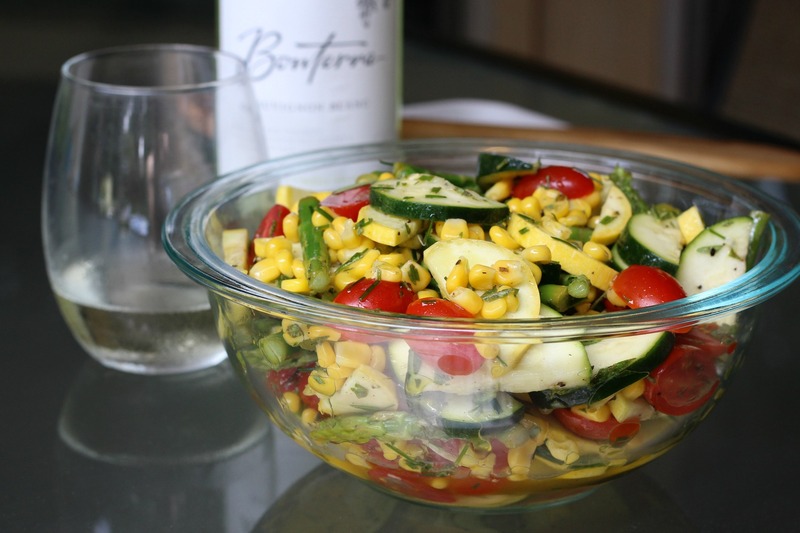 Allow the succotash to “set” by sitting on the counter or in the fridge. On the counter in room temp, allow about two hours. In the fridge, the succotash can set up over night. This allows the flavors to meld and the acid from the lemon and vinegar to soften the vegetables. Serve room temperature or cool. Pair well with a dry white wine and a poultry or fish main dish.